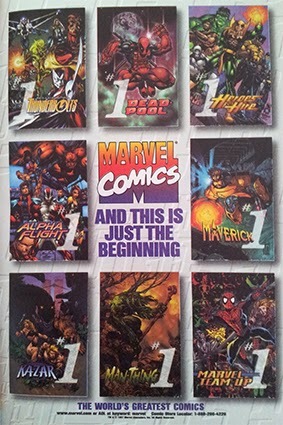 Part of Marvel's eight title boom, as part of the Heroes Reborn/Return era, I think it was the colouring and composition of this full page advert, that helped the reading public believe this was a new team of heroes, stepping up in the void of The Avengers. Mark's work hadn't looked this dynamic since The New Warriors, and written by Marvels' Kurt Busiek, it seemed the perfect chance to get in on something new.. which it was, albeit something old at the same time. Yeah I remember this. I'm actually selling this one now if anyone's interested. It really was truly buzz-worthy for the time considering the crazy reveal at the end. That's when you knew it was going to be good, and definitely helped(i think) start to get the ball rolling with inspiring titles like The Authority, and the Ultimates and the like. Definitely had some elements of the Squad in there, but was it's own thing. Thanks guys. My memory of this series was of skimming through the first issue standing at the news stand, waiting to see if it was worth the buy. Those last few pages of the first issue stunned me. In the age of solicitations, Marvel had still pulled off a complete surprise. Mark Bagleys art has rarely done anything for me - he always draws so ugly; his Donna Troy when he drew JLA looked really bad and I never thought Donna could look bad by any artist. Every face he does always looks as if its snarling. His only high point was his long [100 issues?] stint on Ultimate Spider-Man, his style fitted the athletic hero perfectly. I don't like him on the current FF book at all, and will be glad Marvel Adventures line for three years, he has a lovely clean line. 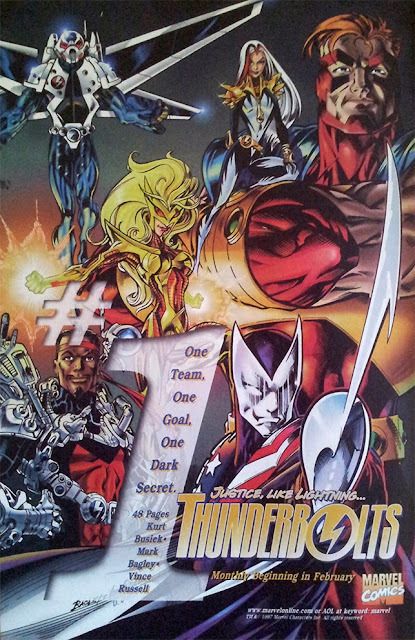 Bagley did suit this Thunderbolts though, has to be said. Even before we knew their secret, his art did hint at 'something not quite right' about this new team, and must say fitted the book to a tee. I think hes far better at home drawing villains instead of heroes. Thanks Karl - I loved Mark's work on The New Warriors, but found it lost something on Amazing Spider-Man when he jumped ship. Not sure what it was, but on Thunderbolts he'd deffinietly reclaimed it again and more so like you a=say on Ultimate Spider-man. I've never read an Ultimate comic, as apart from Elseworlds specials, personally I can't subscribe to alternate realities, but from what I saw that book was a true testament of his skills. Kurt is the true brainchild behind this I think, the concept sounds like a story he planned, and only someone with his skill at writing and knowledge of Marvel, could have got this book so far off the ground in it's early days. Great story and great moment. Best ending to a comic book any of us have seen in a long long time. It was a solid book for a long time and I don't even mind all the changes the team has gone through. It's a survivor because everyone loves a good redemption story, which this was. Miss those days. Hey Kal - welcome to IADW and cheers for commenting Mr! You are right on that whole redemption aspect, and I also think like you hint at, part of what drove people to it, was the idea Marvel was launching a fresh 100% new concept. Sure it didn't turn out that way, but it still kind of was.